When I think about modern jazz trumpeters, Arturo Sandoval, Wynton Marsalis and Terrell Stafford come to mind. But there are many, many talented trumpet players out there that continue to provide great jazz music. One of those trumpet players is Michael C. Lewis. A couple of months ago, Lewis released an album titled Intimate Journey. It has a combination of subtle and gentle jazz pieces along with some nice light groove jazz efforts. Lewis grew up in Houston and then went on to study at the Berklee School of Music. 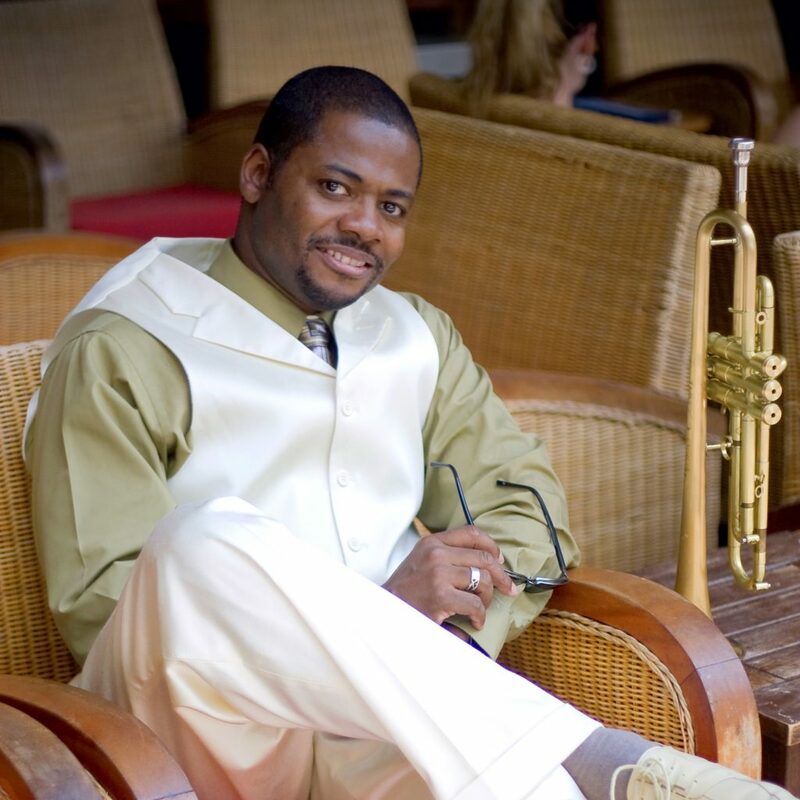 Upon graduation, Lewis continued his education, earning a Master’s degree in Jazz Studies at New York University. Along the way, he has played at venues such as the Apollo, Village Vanguard, The Blue Note and Birdland. To help out on the album, Lewis recruited some top talent. Alva Nelson played piano on a couple of the songs. I reviewed Nelson’s album, Soul Eyes, eight years ago. Andrei Carrier was on guitar. He is also a graduate of the Berklee School of Music and can be found teaching at the Manna Music Workshop in New York. Also on guitar was Billy “Spaceman” Patterson. Frank Ocean, Miles Davis and David Sanborn are but a sampling of the top artists who Patterson has recorded with. Jermaine “Beatdown” McQueen played the drums. His credits include helping out Black Violin once in a while. Gerald Trottman did the keyboards and keyboard rhythm tracks for the album. His work includes composing for such films as Father Figure and Blade Runner 2049. Victor Wise does the drum programming for one song. He can be heard playing at venues like Dinosaur Bar-B-Que with artists like Raine Torae. I reviewed Walter Beasley’s album, Go With The Flow, many years ago. He plays alto sax on a song for this album. As for Lewis, on the album he plays trumpet, flugelhorn, does some programming and also provides vocals on a couple of songs. Houston Nights is the first song. It is a light head bopping groove with some a nice piano solo by Nelson in the middle. Reasons is another light and easy song. Walter Beasley’s sax intertwines with the trumpet of Lewis on it. A Moment has a gentle tone like lovers coming together in the moonlight. Lewis shows his vocal chops with Make Me Say It Again Girl. It is a subtle R & B styled love song. Miles To Go is a cool groove with some interesting vocals from Lewis. The title track, Intimate Journey, has some great smooth trumpet and R & B styled vocals. Soulful Atmosphere has a mellow, head bopping beat with some terrific flugelhorn and slick groove guitar. Beside The Still Waters is a nice soft piece that really showcases Lewis’ trumpet playing. Expressive Lee is a way cool groove piece. The song Reasons is re-visited, this time with a muted trumpet sound. The album closes with Houston Knights. It is a kind of remix of the first song on the album, with a twist or two, including a bit of vocals. 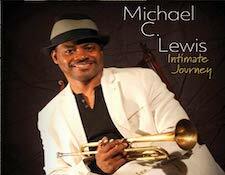 Michael C. Lewis is a very talented trumpeter. He also has a talent for composing. I forgot to mention it earlier, but he composed almost all of the songs on the album. This album showcases both of those talents well. And Lewis made really good choices in the musicians who he had play on the album with him. I was especially pleased to the hear Nelson and Beasley on the album. Intimate Journey is out now so you should be able to get a copy at your favorite music retailer. The official web site for Michael C. Lewis is at www.michaelclewis.com There are songs from the album that you can listen on the site. When it comes to jazz instruments, I greatly prefer the saxophone to the trumpet. That does not mean, however, I don’t like trumpet centric jazz compositions done right. And yes, “Intimate Journey” is a work done right. Lewis is originally from Houston, TX but now resides in New York city. He has performed at venues such as the Apollo Theater, The Blue Note and the Village Vanguard as well as other notable NYC musical and jazz landmarks. And while I would call this primarily a work of jazz, it would be impossible to not recognize Lewis’ interest in R&B and Funk. Because that is what “Journey manifestly is, a pounding, thriving, conglomeration of jazz, funk and R&B. And I loved it. I loved it despite not really being inclined to the trumpet as the lead instrument. One reason why is how Lewis manages to blend such diverse musical styles into each song. I had a hard time deciding if he as a jazz musician with a flair for funk, or a funk musician in the best 1970’s Philadelphia style who suddenly grew a fondness for jazz. Either way is not important. This is, stylistically, a work that kept me interested in what was next through all eleven tracks. And as much as I love jazz, what I really loved first was great funk / soul/ R&B, Earth, Wind & Fire, Parliament, Temptations style of music. Jazz came later. Because this one has both, woven together like a fine piece of cloth, I couldn’t help but love it. Which I do – and certainly will again. MICHAEL C. LEWIS/Intimate Journey: If your ears have a certain amount of miles on them, it’s a little hard to follow why a cat like this isn’t on a major, until you realize majors just aren’t doing their jobs anymore. A multi instrumentalist trumpet player, Lewis modernizes soul jazz in a most invigorating way that brings the style into a whole new focus most appealingly. A tasty work out throughout, this cat has it going on here completely. Hot stuff. MICHAEL C. LEWIS/Reflection: Trumpeter with a solid sense of the past and an eye toward the future turns in a solid, smoking contemporary jazz date that is loaded with it’s own personality even when you know it’s following in Miles’ footsteps (lip prints?). With the best of the seventies attitude of jazz/funk at it’s core, this is a fine display of chops that have been simmering long enough and are now ready to be served. Easy to enjoy even if you are a lightweight jazzbo looking to get your feet a little wetter. This is one of those massage albums that you’ll want to be sure to remain moist for throughout its duration, for anything less would mean chapped hands. Reflection (self-released) is a brilliant album from trumpeter Michael C. Lewis, who at times plays with the unfiltered smoothness of Miles Davis, but he is at his best when he puts the Miles hat on the side and just plays in the key of Lewis. The album is a nice mixture of smooth jazz with some of that quiet storm you know and love, mixing up soulful tones with a solo and walls of synth madness that immediately brings up that vibe you’re looking for in a romantic situation. Arguably, one can just let this album go in the background but I think his playing is worthy of your attention, for while he is more than capable of putting himself on automatic, he doesn’t do that. There are a few mid-tempo songs but in this setting they’re not as good as the slow jams, yet I would love to hear how he plays in an uptempo setting with capable musicians. The mid-tempo songs only bring forward the fact that the drums and percussion are programmed. I have nothing against them, but with Lewis’ style of playing he needs genuine drums to work off of. A necessity, of course not, but this is what I would like to hear, perhaps in future projects. If it’s romance you want, Reflection is the perfect album to suit your needs. If it’s fine musicianship from a trumpeter who knows what he’s doing, Lewis is your man of the hour. Review: I am not usually a big fan of rhythm programming in music but a good musician with a handful of nice compositions could make overlook it. That is the case with Michael C. Lewis new CD Reflection. Almost all tracks on this album are originals, in a smooth jazz style, where Michael shows his sensitivity, great tone and technique. The album starts with Reflection (Sunrise), a ballad that perfectly reflects the tranquility of the morning hours. But you will also find upbeat, funky music like In the night time and Gulf Breeze with Wendell Brooks providing some interesting rhythms patterns for Michael melodies and the R&B style of I dedicate my heart. Miles to go, a funk track mixed with a little bit of hip hop. Michael shows his romantic side on the ballad I need your love and the sensuality of the night on Night Fall. Reflection (Sunset) ends up the album in a relaxing mood, with ideal melodies to listen to after a long stressful day. When I first put this CD in the player and the first notes rang out I would have sworn that I was hearing Herb Alpert’s trumpet, from something he recorded and didn’t make the grade for the Rise sessions back in the 80s. How wrong could I be, it was of course Michael C Lewis and his opening track, Reflection – a lovely, melodious introduction to the album and the musician. Track two, Gulf Breeze had me thinking of Miles Davis, back in his ‘Cool’ period. Now, I don’t mean to imply that Mr Lewis is a copycat, but his lovely playing does bring back memories of the styles of other musicians, and of course, all musicians are influenced by their elders. With both trumpet and flugal horn Michael C Lewis is a master, he simply weaves magic out of each instrument, and then he goes to prove that he is also an able vocalist, offering soulful vocals on a few tracks. This is one of the most melodic, slightly funky and extremely tasteful jazz albums I have had the pleasure to listen to. There is something of the funk-jazz of the Crusaders in there too, which adds a velvet sheen to the music – mostly self-compositions, but there are a few covers, like the Carpenters’ We’ve Only Just Begun. I think Reflection has the crossover appeal to attract the soul and jazz audiences, and repeat the success George Benson found when he mixed soul and jazz together. This is a very fine album – seek it out.